I’m hoping that one thing you have learned from reading the MarketingExperiments blog is that there isn’t much in the marketing world that can’t, or shouldn’t be, tested and optimized. We are used to looking at the top of the funnel – optimizing landing pages, website headline copy, email campaigns, etc., but what happens after you capture that lead? Can’t the buying process be tested and optimized as well? The short answer is, yes, the funnel can be optimized – and it should be! Before you can optimize lead progression through the funnel, you must first identify what that process looks like. At MarketingSherpa, we have just launched our annual B2B Marketing Benchmark Survey to identify key tactics B2B marketers can use for funnel optimization, and to ensure success in an increasingly challenging environment. 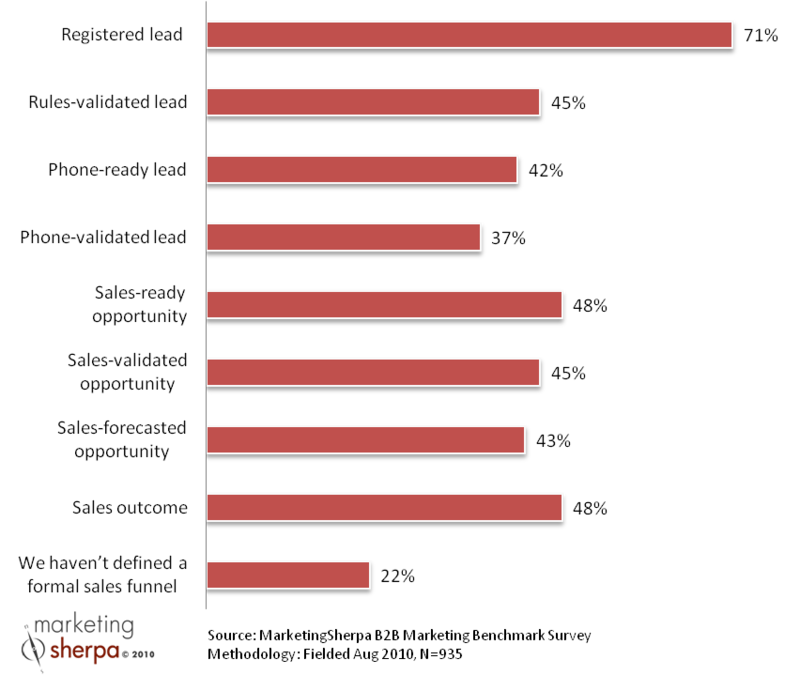 Marketing-Sales funnels will vary in complexity from one organization to the next, and the above stages were provided to study participants as a sample guideline. What’s surprising is that nearly a quarter of participants indicated that they have not yet defined a funnel. Of the remaining participants, nearly all of them indicated that they tracked the first stage of a registered lead, but that’s really a gimme. Everyone tracks that. After registered lead, participation levels drop to fewer than 50% for all remaining funnel stages. We’re looking forward to seeing how these levels of participation may change in this year’s survey. Once you have identified your Marketing-Sales funnel, you can start to develop lead nurturing strategies that will optimize lead progression from one stage to the next, ultimately accelerating sales pipeline performance. Hopefully this brief list will get your creativity going. At the end of the day, we must define our buying processes, and then use any tools at our disposal to optimize a lead’s progression through the funnel in order to protect our marketing investments, accelerate sales pipeline performance and fuel overall success. Good thought provoking article. Too often in sales we focus on the top of the funnel or the very bottom without looking at what can we do to move things through the funnel. I also tell people in my workshops to rethink what goes in the funnel.